Swing’s the thing on the corner of Franklin and First in Historic Downtown Clarksville this month as F&M Bank proudly presents the ’30s and ’40s musical revue THE ALL NIGHT STRUT! at the Roxy Regional Theatre. A delightful romp through the dance and music of the 1930s and ’40s, THE ALL NIGHT STRUT! is bursting at the seams with jazz, blues, bebop and American songbook standards, weaving together the work of legendary songwriters such as Hoagy Carmichael, Frank Loesser, Duke Ellington, Johnny Mercer, Cab Calloway and the Gershwins. 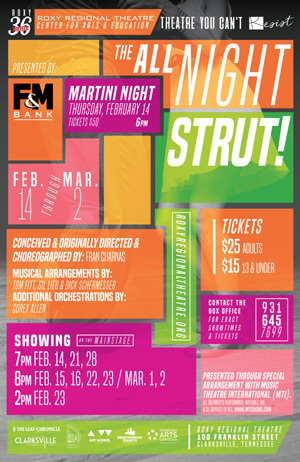 Kicking off the run on Thursday, February 14, at 6:00pm, is a special Valentine’s package, “Martini Night,” featuring an unforgettable evening of cocktails and sumptuous hors d’oeuvres, followed by the 7:00pm performance. Catered by Yada Yada Yada Deli, the evening’s menu includes chicken salad in phyllo cups, meat and cheese charcuterie, caprese salad skewers, meatball sliders, twice-baked baby potatoes, assorted desserts — and, last but not least, vodka martinis and gin martinis with all the fixin’s. Non-alcoholic beverages will also be available. Tickets to “Martini Night” (including the performance) are $50 per person. THE ALL NIGHT STRUT! begins its run of performances for the general public on Friday, February 15, at 8:00pm. In keeping with the theatre’s traditional pay-what-you-can opening night, all tickets not pre-sold at the regular ticket price will go on sale at 7:30pm that evening for a $5 minimum donation. Tickets are $25 (adults) and $15 (ages 13 and under) and may be reserved online via the below button, by phone at (931) 645-7699, or at the theatre during regular box office hours (9:00am to 2:00pm, Monday through Friday, and one hour prior to curtain). Military, APSU students and CitySaver coupon holders can receive two tickets for the price of one to Thursday 7pm performances during the run (excluding “Martini Night” on February 14).